We’ve all seen scale models of the universe before. There are gifs and websites and a plethora of videos. However, you’ve probably never seen a model like this. 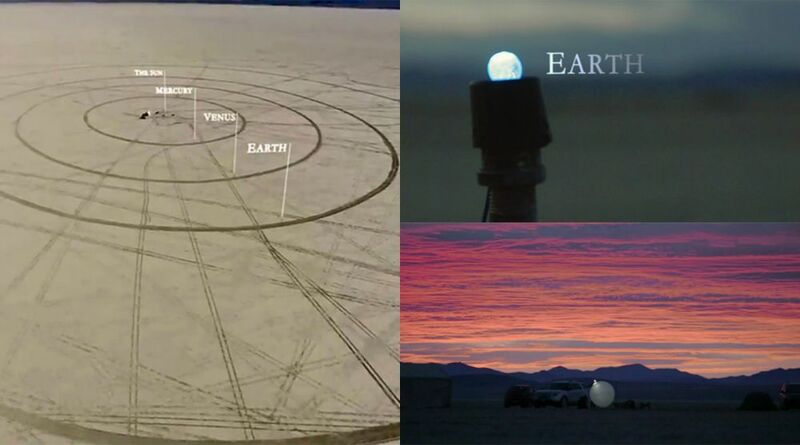 Filmmakers Alex Gorosh and Wylie Overstreet decided to build a scale model of the solar system on Earth and film a timelapse of the travels in a new short film – To Scale. The farthest planet from the Sun, Neptune, has an orbit of about 165 Earth-years. It orbits at the icy edges of our corner of the universe, some 2.79 billion miles (4.49 billion km) out from the center of our solar system. So if you are going to use an Earth that is about the size of a marble (which is what they did), then you need at least 7 miles (11.2km) to get the correct scales to setup your solar system. So the duo headed to the Black Rock Desert in Nevada, where there is enough space to stretch out. Here’s a short of the making of clip if you want more information.